Where your taxes go to work for YOU. Reduces the cost of electric power and overall energy costs. Reduces dependence on filthy fossil fuels, foreign oil & the money available to terrorists. REDUCES POLLUTION (air, water, land), and thus health problems, healthcare costs, etc. Creates valuable jobs - developing domestic industry - improving the economy & the trade deficit. Takes us to energy independence - improves international relations & security in the U.S. Enables clean low cost conversion to Electric Vehicles - seamlessly (with ZINC - AIR Batteries). Enables MODULAR HOME POWER - less dependence on the grid - greater self-sufficiency & security. Reduces the need for the environment & health damaging high voltage power lines. 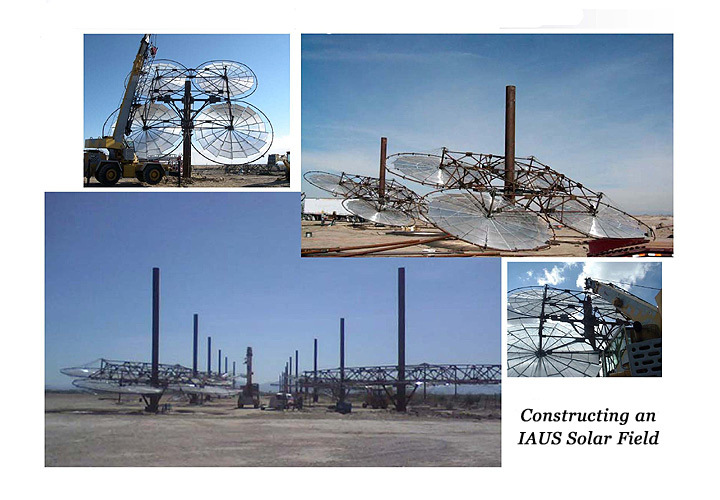 Provides viable, lower cost and clean power in remote areas. Creates wealth - more for the people, than the oil & politically connected rich & controlling elite. Would you like to have the taxes you pay go into an income producing asset for you? Through a program sponsored by the government, you can have the taxes you paid last year and are paying or owe for this year, invested in a renewable energy power plant (in your possession). � Amounts contributed are reimbursed by, or will not be owed to, the government. Federal Income Tax Benefits make it possible to purchase equipment and ownership in a Solar and BioMass Power Generation Plant with no out of pocket expense. � Tax benefits cover the entire cost, and more. A Public Company with New Low Cost Patented Biomass and Solar Power Technology with a New Bladeless Turbine, which can all be mass produced, makes possible this "no cost" deal to tax payers. The purchase of 1 unit of ownership (a 600 Watt section) of this solar thermal and biomass power plant requires $1050 and gains tax savings of close to the same amount (credit of $900 + depreciation savings of at least $80 in the first year, and more in following years). � So the participant puts out (or loses) about the same amount of dollars they would have by paying their income tax, but now owns equity of $1050 in the power plant instead of nothing - a gain of close to 100% within a few months if not immediately, depending on the timing & their tax situation. Then the annual income to the participant is contracted to be $120 per unit, or close to 11% of the amount purchased. � Although this percentage is really much higher, as it is really all windfall - free income, since the "investment" is made by, or reimbursed by the government. Someone in a higher tax bracket with an income tax liability of around $20,000 could purchase 14 units of the power plant for $14,700 ( = 14 x $1050) and realize a tax savings of $13,680 to $19,020 (credit of $12,600 + depreciation savings of $1080 to $6420 using bonus 50%) - a possible 30% gain just from tax savings, in the first year. � So they would be saving minimally close to the amount they contribute, to possibly gaining $4320 ($19,020 - 14,700) cash in their pocket, along with the gain of $14,700 of equity in the power plant. Anyone can benefit from this program, individuals or companies, large or small, with tax liabilities of a few hundred dollars to millions. Tax benefits like this, that usually only the wealthy are able to utilize, are available here to the "little guy" as well -- utilizing / eliminating 100% of tax liability (as good as it could get). � Now you don't have to feel like, the more you work and earn, the more you lose to taxes. You can save and put to work, all the money you make, and in one of the most secure and valuable industries. Participants need not even come up with any extra money in advance. � Planning ahead, they can save their taxes first - by dropping their employee withholdings (W-4) or the self-employed can stop paying their estimated quarterly tax payments during the year (saving that money) and then investing (purchasing) a similar amount in the solar power plant (after the would-be tax dollars are accumulated) and then not being required to send that money to the government. �� So it is easiest and most beneficial now, during the year to reduce or stop paying your income taxes (through withholdings or quarterly payments) - in order to keep your options open - to not have to come up with additional funds to make the purchase, nor have to wait to get that money back. � Then, if and when you feel comfortable with this program, company, technology, etc., and as your savings and tax liability grow during the year, you will be able to simply decide (with no increased financial burden) whether you want to send that money to the IRS, or invest it in renewable energy. � Although there are considerable benefits and a bonus for getting involved early. The federal income tax credit on renewable energy is 30% of the total cost of the equipment purchased ($3000 per unit in this case). � So the credit amount is $3000 x .30 = $900. � The company selling the equipment requires a payment of just 35% of the total cost or $1050 per unit ($3000 x .35) so that the tax credit of $900 covers most of, or 86% of the required payment. � Then the cost of this equipment can also be depreciated (because this is a business investment), which produces additional savings (depending on income level and tax bracket, should be $200 to $700). The balance of the equipment cost is covered by the revenues, so participants will not need to make any additional payments. The planned 11% income makes this a very positive deal even if people were using their own money (with no tax or other benefits). Considering the financial condition of most banks, as well as the government, this could turn out to be safer than having your money in a bank, and with a much greater potential return. Here you actually own a physical asset (not just a paper promise). Also, considering current economic turmoil, it is wise to be diversified, and especially in the industries of necessities. The equipment is a type of magnifying lens (22 or 30 feet in diameter) with accompanying apparatus and installation (and biomass burner for around the clock operation) that will power a new, patented, blade-less, efficient turbine and generator, part of this renewable energy farm. � Every part is made from common materials and can be mass produced in existing manufacturing facilities - no new sophisticated expensive plants are needed. � This is a major reason for the lower cost, and will enable the company to grow quickly. � The power plant is being built in southern - central Utah and will be operated and maintained by a power company. � Anyone interested may visit the power plant facility whenever they like. This equipment is priced at $5 per watt of generating capacity. Those familiar with the cost of solar electric generating equipment (photovoltaic - PV, as well as Concentrated Solar Power - CSP) will recognize this price as not only competitive, but lower than most competing technologies. So the program here is NOT unrealistically based on an inflated (bogus) cost of the equipment. Rather it is based on, and made possible by, valuable low cost new technology. � Independent scientists and engineers from 4 different universities (M.I.T., DePaul, U.C. Davis & Berkley) have done a scientific analysis and professional white paper on this system and have judged it to be better or lower cost (roughly 4 times) than the next best solar power system. 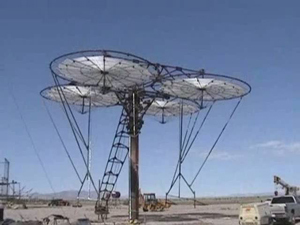 � In an area of a one hundred mile square (10,000 square miles) in the southwest desert, this system could provide electric power for the whole United States. "Christmas Gift for Clean Power: Extended Tax Package"
"Solar Energy Zones Planned for Western States, Including Colorado and California"
For anyone INVESTING / TRADING in the stock market, here is info on a new AUTOMATIC (Robotic) TRADING PROGRAM that protects you from crashes, vigils your account constantly (without your attention), pulls you out or reverses positions when the market turns (automatically) - reduces / eliminates losses, AND regularly generates 10% gains per MONTH - the "no brainer" for INVESTING IN THE STOCK MARKET. Disclaimer: We are not in the business of providing tax advice. All statements here are for the purpose of information - on possible business and tax benefits for those with the appropriate financial situation. All interested parties are responsible for their decissions and to acquire their own legal and tax advice. © Copyright 2015 Web Sites Plus. All Rights Reserved.